Allstate agency owners secured $63,000 from The Allstate Foundation Helping Hands grant program to benefit Safe Nest, a local provider of domestic violence services and advocacy in Las Vegas. Nevada consistently ranks first in the nation for domestic violence fatalities, according to The National Coalition Against Domestic Violence. To help raise awareness and break the cycle of domestic abuse, 63 Allstate agency owners and financial specialists collected items for survivors of domestic violence. The agents also secured $63,000 from The Allstate Foundation Helping Hands grant program to benefit Safe Nest, a local provider of domestic violence services and advocacy in Las Vegas. The nonprofit will use the grant to cover the cost of confidential and comprehensive services including housing, counseling, advocacy and prevention for survivors of domestic violence. • EARLY EDUCATION — Helping children reach their potential. • STUDENT SUCCESS — High school graduation. • POST-SECONDARY ATTAINMENT — Access to college or vocational training. • WORKFORCE SUPPORTS — Getting a job for sustainability. • There is often hesitancy to go “all in” with program efforts if agencies are unsure if funding will be there next year. This assures them multiyear support so they can go “all in” and build momentum and sustainability. • It encourages collaboration building — which is a higher level of self-sacrifice to solve community issues, requiring agencies to be more than just a referral network between organizations. • Reduces administrative burden of grant application through automatic renewal/extension if they meet evidence-based impact deliverables. By mobilizing a team of engaged volunteers and donors, the community will select the nonprofits and coalitions with proven, bold and innovative strategies that will truly impact community change. Those who are funded will receive financial and organizational support and the opportunity to gain communitywide recognition to expand their impact. 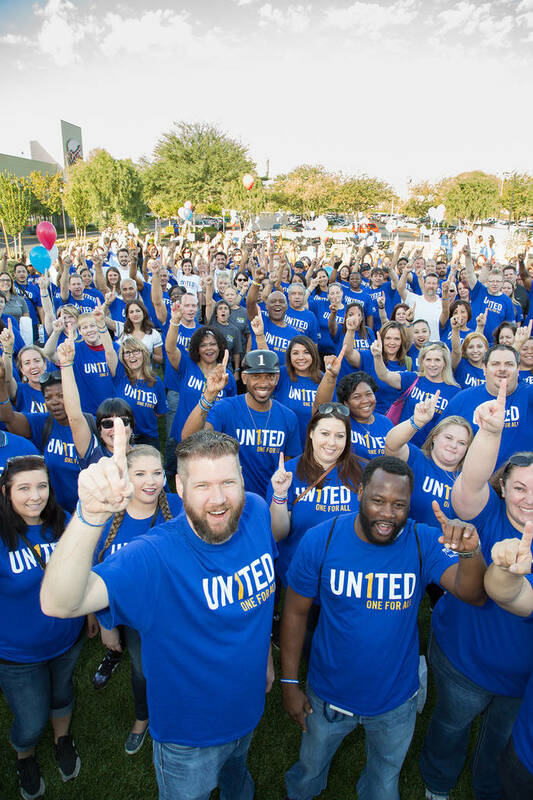 To learn more about the 2018-2021 Community Impact Investment Process, visit uwsn.org/FundingOpportunity. America First Credit Union teamed up with the Vegas Golden Knights to create the Game Changer Program, honoring teachers in the Clark County School District. The program awarded four teachers who made a positive impact in the classroom and in the lives of students, each with a $1,000 grant. Each recipient was announced and rewarded at various Vegas Golden Knights home games. The first recipient, Lisa Withrow, is a teacher at Valley High School and was nominated by more than 20 of her students who wanted to celebrate her dedication to their education. Aron Anderson, a teacher at Coronado High School, was awarded for his exemplary dedication to his students and his outstanding work in the classroom. Christopher Della Valle, a math and special education teacher at Shadow Ridge High School, was the third winner and was nominated because of his inspirational commitment to education. The final awardee was Catherine Callisto, a biology teacher and athletic director at Sierra Vista High school, nominated by her students and peers for her inspirational dedication to her student’s success. Nathan Adelson Hospice will hold its 15th annual John Anderson “Celebration of Life” Live Butterfly Release on The Lawn at Downtown Summerlin at 2 p.m. April 29. Southern Nevada community members are invited to celebrate and honor the memory of lost loved ones during this annual event, which takes place on the large lawn area at the shopping center, 1980 Festival Plaza Drive. The butterfly release will commence at approximately 2:30 p.m. Butterflies can be reserved in advance for $50 a box, with each box containing two butterflies, by contacting Stephanie Forbes at 702-938-3910 or via email at sforbes@nah.org. Sponsorship opportunities are available. The event — named after a beloved 23-year Nathan Adelson Hospice employee who passed away in April 2007 — is open to the public. The premise of the butterfly release is based on an American Indian legend for carrying wishes to the heavens. The legend claims that if anyone desired a wish to come true, they had to capture a butterfly and whisper that wish to it. The butterfly, which makes no sound, could not reveal the wish to anyone but the Great Spirit, who hears and sees all. The butterfly carried the wish to the heavens to be granted. The annual event brings together hundreds of friends and families to release more than 500 butterflies in memory of loved ones who have passed away. The Shade Tree, a 24-hour accessible shelter designed to specifically meet the needs of women and children in crisis, announces two $45,000 grants totaling $90,000 from The MGM Resorts Foundation. The funds will be used to support The Shade Tree’s Children’s Activity Center and Survivor Services Center. On average, The Shade Tree provides assistance to 15 new families each day, and the Children’s Activity Center and the Survivor Services Center are two of the organization’s crucial programs that promote stability, dignity and self-reliance. The Children’s Activity Center is designed to address the special needs of children who are experiencing homelessness and abuse by providing a safe, non-intimidating environment for the children to learn, grow and play. The Survivor Services Center provides critical assistance to victims of domestic violence, sexual assault/sexual abuse, street crime and victims of elder abuse. Victim advocates help survivors with the legal process, assessing services needed for individual situations and more to create a safety plan to help reduce the risk of future violence. Credit One Bank presented a $20,000 check to Nevada Partnership for Homeless Youth (NPHY) at City National Arena. 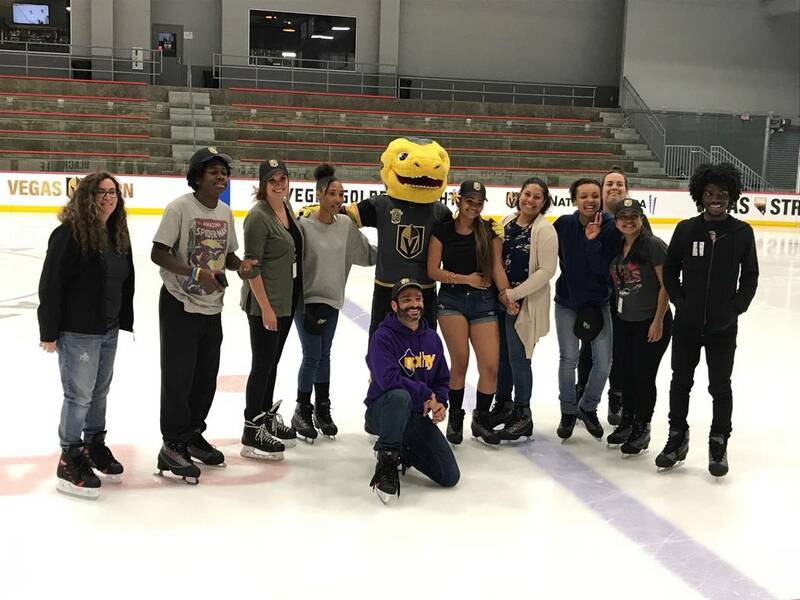 During the event, 15 NPHY clients had the chance to skate on the same ice the playoff-bound team practices on and were paid a special visit by Chance, the Vegas Golden Knights mascot. 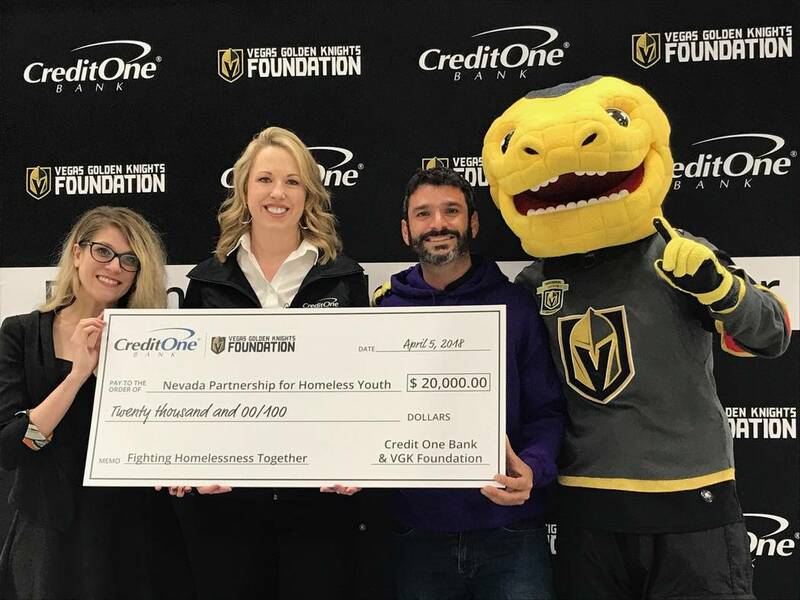 “Credit One Bank wanted to do more than just donate money; it was important to us that we do something fun to activate our partnership with Vegas Golden Knights. With the help of the foundation, we were able to bring some of the youth out to enjoy a fun night out skating during a historical time for our city, said Amy Chasey, assistant vice president of marketing communications for Credit One Bank. “Our youth don’t have access to some of the same opportunities as many of us, so to be able to skate on the same ice rink as the Golden Knights is creating a lifetime memory for them,” said Arash Ghafoori, executive director of NPHY. As part of the Vegas Golden Knights 59/41 raffle, $10,000 was raised at the March 2 home game and $10,000 was matched by Credit One Bank. In August 2017, Credit One Bank was named the official credit card and sponsor of the Vegas Golden Knights.